Like most aspiring pundits, I enjoy Googling things just to make myself upset. That's why I just ended up doing a news search just to see what Michael Moore has been up to. I clicked on exactly two articles about him and the contrast was beautiful. One was a list of suggestions he made for organized trespassers and the other was his cancellation of a comedy festival he helped organize out of fear that drunks from a brew fest would trickle in again. 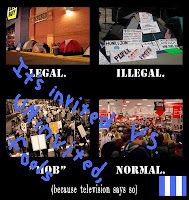 Students should spend this winter doing what they are already doing on dozens of campuses -- holding sit-ins, occupying the student loan office, nonviolently disrupting the university regents meetings, and pitching their tents on the administration's lawn. You may have noticed my introduction of a bold font at one point. Prepare to see it again. An unwanted loud band of drunks competing for the spotlight sounds like the right medicine for Moore's comedy festival. It's too bad he canceled it, the irony would have been the best part of the show. Forgive the post title's accusatory tone, but after reading this classic Bryan Caplan piece titled "Are Low-Skilled Americans the Master Race?" I can't stop myself from drawing the same comparison. OK, suppose you could give American high school dropouts an 8% raise by deporting every man, woman, and child from Latin America back to their home countries. Would that be the right thing to do? I don't think my opponents are inspired by racism, but it is true that the people they aim to help will typically be members of their own race, while the people they intend to harm will often be from another race. Occasionally you do see localists arguing their strategy is a positive-sum game (it's not) but the majority of the time localists claim that the local people need to be the ones profiting, not outsiders. This parasitic philosophy should be right at home with the people who ignore tragedies because they occur in non-English speaking countries. There are two guiding texts that shaped the way I write. The first one is Politics and the English Language by George Orwell, which I've written about before, and the second is The Elements of Style by Strunk and White. This week Russ Roberts linked a mustache-enhanced rap video about The Elements of Style between students playing William Strunk, Jr. and E.B. White. The project was an attempt to communicate the ideas from Strunk and White with the same rap formula used for Keynes and Hayek. I don't think the song is well done or catchy so I'm not embedding it here, but it does present a good question: Is this the start of a trend, and if so, where is that headed? Will we see clever rhymes and slightly cartoonish costumes with Milton Friedman trouncing John Kenneth Galbraith? Will Paul Samuelson and Greg Mankiw take to the mic to decide who wrote the better textbook? Will there be a duet between Carl Sagan and Richard Feynman? OK, there already is, but you get the point. There is one set of econ rappers I'd love to see, although their song topic would be pretty open ended. Can you picture two 20-somethings try to replicate these mugs? Norway's butter protectionism just jumped the shark. Last week I showed how Norway's stupid "buy local" style butter laws reveal the real consequences of restricting consumers to local producers. The country is experiencing a butter famine, thanks to unexpected low production and high demand, and those trade barriers are blocking butter from entering the nation. Now two Swedes have been arrested for helping the public by bringing butter into the Norway. Remember how 250 grams, or about two sticks, was selling for the equivalent of $13? These guys were selling the same amount for $42. High, yes, but not as high as some Swedes were asking for online. Mike Munger double posted on this issue, on his regular blog and the new euvoluntary exchange blog, and came to the same conclusion: Norwegian consumers are suffering from a lack of butter and the authorities are still patrolling the borders to keep any new butter out. This is akin to the Haitian government blocking post-earthquake volunteer doctors from entering the country to promote the domestic medical industry. After this incident if you require more proof before you'll believe that "buy local" is a wasteful pipe dream, odds are you won't be literate enough to read it. Sorry Norwegians, I'd love to help you out, but if I did I'd be arrested. Out of respect for Christopher Hitchens I am not calling him a personal hero, the way he declined to call George Orwell a hero. I have been a fan of Hitchens since his 2006 appearance on Real Time with Bill Maher where he said George W. Bush IQ jokes require zero creativty, but in a way that did not defend Bush. A lot has already been written about his honesty, wit and refusal to fall neatly in line with any political orthodoxy. He was a self-described socialist who wrote a book called "God is Not Great," yet supported the Iraq war and opposed abortion. Instead of retracing that ground, I am just sharing my all-time favorite "Hitchslap," which is the first four minutes of the following video, a link to his appearance on Econtalk and an excerpt from a talk he gave to the Cato Institute. But suppose all this was really a good idea—people might live longer. Suppose all that was really true. There would still be the question of enforcement, that awkward little bit that comes between your conception of utopia and your arrival there. The enforcement bit. You could appoint regulators and inspectors to enforce the law. It would take quite a lot of them, but you could do it. There are such people. I know about them because they’ve come after me. My editor, Graydon Carter, the splendid editor of Vanity Fair, and I were having a cigarette in his office. And someone on our staff—it’s not very nice to think about it—was kind enough to drop a dime on us. And round the guys came. “You’re busted!” These people are paid by the city, which evidently has no better use for its police. I think that’s bad enough. But then Graydon went on holiday, and I went back to Washington. And his office was empty. But they came round again and they issued him another ticket because he had on his desk an object that could have been used as an ashtray. In his absence. With no one smoking. But there are officials who have time enough to come round and do that. The worst part is that the staff has to become the enforcers. The waitresses have to become the enforcers. The maitre d’ has to become the enforcer. He has to act as the mayor’s representative. Because it’s he who is going to be fined, not you. If you break the law in his bar, he is going to have to pay. So everyone is made into a snitch. Everyone is made into an enforcer. And everyone is working for the government. And all of this in the name of our health. Hitchens often said the public would be willing to vote for an atheist president, they just haven't been smitten by one yet. If asked, he continued, no one in the 1950's would say they'd vote for a "washed-up B-movie actor" because they hadn't met Ronald Reagan yet. With that in mind, I'm glad to see from the public outpouring that I'm not alone in my reverance for the passing of a godless chain-smoking combative anti-abortion bisexual warmongering rich white male immigrant socialist. 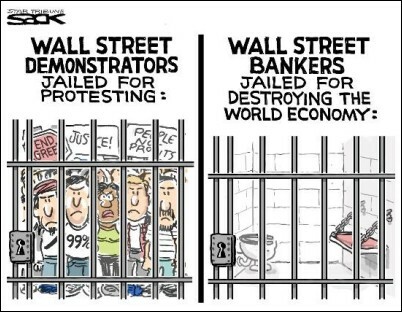 The band NOFX wrote a sympathetic anthem for the Occupy Wall Street movement, but the lyrics are the same old drivel. These platitudes don't cover what the movement is really about - a loose alliance of radical anti-capitalists and mainstream liberals so eager to protest a grab bag of progressive talking points that they're willing to tolerate law breaking. "The Trees" by Rush is tempting. It's a metaphor for progressive "fairness" polices told through a group of trees that aren't getting enough sunlight because of the tall oaks. We will make them give us light"
The lyrics do a great job of showing how progressive economic policies end up destroying wealth, not simply redistributing it, and are inherently unfair. However, it's not targeted to protests and isn't specific enough to be considered a theme song for the Occupy organized trespassing movement. This one isn't fair. While the movement is maggoty with lazy non-stop drummers, it's not fair to say the core of the group doesn't want to work. Most of the protesters want to perform labor under a different economic system. Plenty of sympathetic college grads majored in "fun" things like literature or music that don't prepare them for obtainable careers and while they bear some responsibility for their foolishness, it's still hard to find work for everyone. That's why I distance myself from other critics who say the protesters want the government to provide everything for them and just need to get a job. Most of them want to work and can't find it. "Baby, I'm an Anarchist" by Against Me! is a radical protester telling a progressive that they may be on the same side of a few issues, but the progressive underestimates how extreme anarchist positions and tactics are and the two will never see eye to eye. This song plainly spells out to progressives that the anarchists don't respect them, don't believe the current system can be reformed and are eager to use violence. It'd a great choice for the movement's theme song, however a more fitting song exists. "Anarchy means you litter" by Atom and His Package is the perfect song to criticize spoiled pre-packaged anarchists. Ever think there's a difference who you're stealing from? Liberate that bottle of malt liquor! Or who would be left to take advantage of your "help?" Consider it a frustrated liberal speaking back to the clueless bomb throwers who learned everything they know from song lyrics and hurt their own allies. Loyal readers, if you know of a more fitting song, please post it below. Just watch this, and in the event that the video doesn't work, just click here. ABC news has abandoned journalistic neutrality and is trying to stir consumers up with a call for mercantilism. They are telling Americans that evil China is stealing jobs and the patriotic solution is simple and easy. If you know anything about international trade and protectionism, you will see these claims are a xenophobic swill of myths and ignorance. Apparently, ABC was beating this drum last year, and I'm not the only one who had this reaction. Forbes contributor Dan Ikenson wrote "ABC is selling dangerous, nationalistic propaganda." So after nearly a year of crisscrossing the country as part of our Made in America journey, we remembered what economists across the board told us at the very start: If every American spent $64 on something made in America, we could create 200,000 jobs right now. In the four and a half minute video, these activists in journalists clothing referenced unnamed economists several times. They did not show an interview with a single economist or name one. Where do these numbers come from? After sitting through a barrage of these awful clips, some of which include flag waving and rallies organized by ABC, I finally saw a vague attribution to Moody's Analytics that spending 18 cents a day would create 200,000 jobs. However, I have been unable to find the original source, even on Moody's website. Since economists across the board reject this protectionist nonsense, I find it hard to believe. ABC has cherry-picked a minor report and used it to overturn economic science, and now they won't even cite the source and dishonestly present it as a scientific consensus. Shame on ABC for committing journalistic negligence and telling these nationalistic lies. Yesterday I went on forestry management tour, where we saw how foresters choose which trees to preserve and which get the ax, and I ended up talking to a lefty about timber markings. Foresters mark trees with paint or pieces of bright ribbon to identify the tree's fate with different symbols and colors. There is no universal code, so each company has its own language of timber marks. This can cause problems like homeowners who panic and assume the "save this tree" mark means "turn me into a Jenga set" or laborers who misread the code and chop down trees that were supposed to stay up. My new lefty friend instantly concluded the solution is for the government to draft and enforce a standardized code. I thought that would be a mistake. Languages, such as codes, typically emerge through spontaneous order and sometimes we end up with redundancies. Boxes of chocolates have a squiggle code on top identifying the filling with lines of chocolate. Sorry Forrest, but you can know what you're going to get if you just learn to read. The problem is the different chocolate companies have different squiggle codes. This is a coordination problem, but a small one. Workers sorting chocolates don't regularly bounce between companies and a forestry management company marks trees for repeat contractors who can learn the code. We can prosper with standardization. Who says standardization depends on the governments help? Gay swingers developed a hanky code, where wearing a colored handkerchief in a certain pocket lets observers know what sexual acts the wearer is interested in. What regulatory jurisdiction would that fall under? As a consumer, I see a problem with cell phone and laptop batteries being proprietary, where each model can have its own shape and there is no generic product to purchase. AA batteries are universal and interchangeable and their standardization is the result of the federal government working with battery manufacturers and major purchasers. Sometimes, users don't want standardization. Linux and Mac users don't want to use the same operating system as Microsoft. Sometimes there are flaws in the accepted standard, and having options lets people choose the one they feel is right. What if the government wrote a timber marking system that was problematic? If forestry companies were required by law, they could get in serious legal trouble just for using the best system. Imagine if we were required to speak Esperanto, the dismal failure that was designed to be a superior language. Its entirely possible the government could create a poor timber marking system that would handicap companies that adopt it. I told new lefty friend that I'd be happy if there was a recommended universal timber marking system, and companies could ignore it at their own peril. To her credit, she agreed. If it's worth the trouble of switching over, firms will do so. There's no need to bring guns and the brute force of the law down on forestry companies that mark trees with one line instead of two. About a year ago I criticized a video praising a teacher who punished a student for calmly expressing his rejection of gay rights during a class discussion. The video went viral as a celebration of gay rights, but I found it was unworthy as it championed an attack on free speech, no matter how well-intended. Yesterday a friend posted a video titled "Zach Wahls Speaks About Family" where an accomplished college student from Iowa talks about his success after being raised by two women before the state legislature on a gay marriage vote. I'm happy to say that the video has since gone viral, despite being available online since February. Wahls defended the structure of his family and argued something I've only heard one place before, that gay marriage already exists, the legislation is just to get the government to admit it's there. My family really isn’t so different from yours. After all, your family doesn’t derive its sense of worth from being told by the state: “You’re married. Congratulations.” No. The sense of family comes from the commitment we make to each other. To work through the hard times so we can enjoy the good ones. It comes from the love that binds us. That’s what makes a family. So what you’re voting here isn’t to change us. It’s not to change our families, it’s to change how the law views us; how the law treats us. In social circles, gay marriage already exists in Maine - it just hasn't been legally certified... The only difference is Augusta currently doesn't admit these romances exist, and the legal rights and responsibilities that come with marriage are not automatically included. Congratulations to Mr. Wahls. His important message deserves to be heard by as many people as possible, and I'm glad to see that it's spreading. This is exactly the sort of message that should spread. I visited Maine for Thanksgiving weekend and stopped by the Occupy protests in Augusta and Portland to spend some more time talking to the protesters about whats important to them. The two Maine encampments were a stark contrast to the energetic Occupy Boston protest I visited when the movement was still young. The protesters seemed somewhat bored with the whole thing and perhaps resented the snow on the ground. A substantial amount of the protesters focus has shifted from issues like income inequality and corporate personhood to the movement itself. The first person I talked to at Occupy Augusta on Friday was Jarody, a tea party protester and former Republican candidate for the state house. When I asked him what are the important issues, he said the most important thing he cares about is that the Occupy movement is not hijacked by established political groups. That is to say, his primary interest in this protest is that he wants to participate in a protest with a degree of purity untouched by outsider organizations, or protesting for the sake of protesting as long as it's pure. I also heard a lot of calls about free speech and the right to protest. Jarody and other protesters tried to dodge when I asked them about the legality of their tent city in the park and said they have a day-to-day understanding with the capital police. This is odd because the whole point is to illegally occupy land to attract attention, then play the victim card when police enforce the law. They called a meeting while I was there with fellow bloggers Nate and Michael Hawkins announcing that capital police told them the eviction notice is coming Monday. The person leading the meeting, possibly named Lou, said he had been waiting five or six weeks to be arrested here, and the time was finally coming. He told the other members to call more people in to be arrested with them. "They're be a lot of people coming here who will want to be arrested," he added. It reinforced my view that the left sees being arrested as a martyrdom, and uses these self-made martyrs to convince the gullible that the police are cracking down on them for their views, not for trespassing. One person said during the meeting that if the police pepper spray him, he will spray them back. This person was clearly an idiot, and to the groups credit, the idiot was told he can't do that. As of this time, Nate reports that the camp in Augusta is still around. Over the weekend nine people were arrested for hopping the fence of the governors mansion and stringing up a banner, but none of them were there Friday. The protesters I talked to said if the police told them to leave or be pepper sprayed, they'd choose to be pepper sprayed. One issue that united the 15 members of the Occupy Augusta was an opposition to genetically-modified food. They were picking at two roasted turkeys still sitting in their pans. One of them was filled with potatoes, mushrooms and onions (I assume it was a gluten-free attempt at stuffing) and it was obviously the cook's first bird: it was left sitting in two inches of congealed fat and the paper packet of internal organs was left inside when it was cooked. The Augusta encampment had a teepee for sleeping in the center surrounded by smaller tents. The communal tent had brand-new metal shelves that organizes said were donated. There was a left-wing library, picnic tables, boxes of donated food and a few trays of loose tobacco for communal cigarettes. The system seemed to work, as there were only 15 people, but Nate said that number doubled to 30 when the police tried to clear it out today. The most telling moment was when one of the protesters gave a long pour of table salt into a big cup, then came back a minute later to pour more and walked away. I said to Jarody, he's not salting the walkway with that, is he? Jarody looked at me with wide eyes and said "Someone needs to stop him!" I had a good time talking to the protesters in Boston and Augusta. I didn't enjoy the protest in Portland, known as Occupy Maine, when I stopped by Saturday at noon time. I saw a group of about half a dozen people sitting lazily around a picnic table. No one was talking about I sat down with them and said I was a blogger originally from the area who wants to know what issues are important to them. One person asked what town I was from and then there was a big pause. A wrinkled woman around age 60 glared at me and said I was being rude. She said I was interrupting them and went on (rudely) and insisted they were in the middle of talking. They weren't, but there's no point in arguing with crusty old hippies. I told the group that they're here to protest and identifying the issues they're protesting should be something they want to do. I ended up talking to a young woman named Jenna, who was just there for the weekend. Jenna insisted the most Americans quality of life and standard of living had been dropping since the 1970s because of the rise in things like health care costs. She said she knows it sounds crazy to say she's anti-capitalist, but wants to replace capitalism with a different economic system, although she said she doesn't know what to replace it with. Another of her points was that the strength of the movement comes from not having a list of demands. She said she'd rather see a revolution that be promised demands that will never come. That was all I was able to get out of the Portland group. I later learned why they've been on edge. The week before one of their members had attacked a critic, and two others choked and bludgeoned a third member for banging a drum at 7 a.m. On Thursday Jason Carr, the one who assaulted someone for disagreeing with their message as he tried to leave, was arrested again for domestic violence in the camp. A couple was also arrest for hitting one another and a third person was arrested for disorderly conduct. One of my friends has been an organizers there from the start and he looked exhausted. After a quick talk he expressed frustration with running the group, which he said was like herding cats. I don't want to steal Larry David's shtick, but there's no logical reason why the slice of leftover lemon meringue pie I had this morning is any less a legitimate breakfast item than a lemon jelly doughnut. And in the same vein, leftover birthday cake is as legitimate a breakfast item as coffee cake. I'm not sure about cheesecake and cheese danishes. That issue requires more (delicious) research. The skeptical community is roughly 70 percent progressive and 30 percent libertarian, at least according to an informal poll at TAM 7. While that's nowhere close to a majority, it's two to three times larger than the American public at large and I think it should be higher. Last week it came out that the European Union prevented a bottled water company from putting a statement on their product that said water helps prevent dehydration. Their academic panel spent three long years on the case and declared that since pure water isn't the only way to prevent dehydration, the claim is misleading and can not be printed. My fear is that this sensational event will create a public backlash against regulatory agencies reviewing health claims by product manufacturers. This is a dramatic and emotional case that can have undue influence on what should be a thoughtful and nuanced discussion about the proper role of regulation in health claims. I suspect the anti-regulation crowd will jump all over it. Well, here I am. It's not that I'm against all regulation, I just want less of it. I even support regulation to stop fraudulent claims on products, which is exactly what this case was supposed to be about. But unlike my friends and fellow skeptics on the left, I know the regulations tend to end up grotesque and flawed. I want fewer regulations because there is no reason to expect the regulations will be based on the best knowledge available and with the public interest in mind. "...We all think that our personal order of values is not merely personal but that in a free discussion among rational people we would convince the others that ours is the right one." Progressive skeptics assume they will be the ones who write the regulations simply because the science is on their side. Granted, it usually is, but that's a naive way to look at the political process. Remember corn-based ethanol? The government funneled taxpayer money to big corn producers to convert their food product into fuel. We quickly learned that the fuel is inferior and harms engines, there is no net energy gain from all the fossil fuels we put into ethanol and the corn shortage caused mass starvation in other countries. Corn-based ethanol is a bad idea and the public turned against it, yet the subsidies remain. And why wouldn't they? The corn industry has a lot of money to spend protecting these subsidies, where the public's benefit is spread among many people. It's the old political game of dispersed costs and concentrated benefits. I'd love to ban homeopathic products for claiming they can heal people, but fighting that battle is a waste of my time. I gain very little waging that war, where the sham medicine companies have a lot to lose and will spend a lot of money protecting their business interests. That's why I concentrate my efforts on convincing potential consumers. Skeptics assume that merely being right will guarantee victory in a political system run by people. Yet skeptics understand that most people aren't relentless critical thinkers and will believe myths and fables, including the people likely to be elected. There is no reason to believe the people they appoint to a position will be the brightest, most competent, or share the same love of science. Look at Orac's ongoing posts about defunding the NCCAM, the federal governments alt medicine $121 million annual laboratory. I've written about defunding it too, but I know that's not going to happen with our government. When lefties talk about regulation, it's in a state of perfection. They assume the regulators will have perfect knowledge and constantly update the regulations to the latest scientific understanding. They forget about unintended consequences, such as forming a board to stop soda companies from saying their product cures cancer only to have that same board declare that water doesn't prevent dehydration. Skepticism is a process of discovery, it is not a set of positions one takes. With a hands-off approach to government, I would have better control over how much of my money goes to chiropractors or homeopaths. Under current federal regulation, all health insurance policies must offer chiropractic options. Our private actions also respond faster to new information than it takes to write new government policies. The comparison should not be between no regulation and perfect regulation, but a different society that adjusts to having fewer regulations and a world with many imperfect regulations that solve some problems and cause new ones. 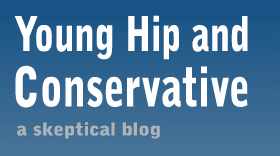 While I don't expect all skeptics to switch camps, I'd like them to consider being more libertarian in their approach. The left has this habit of trying to get arrested, then looking at the arrests as a noble sacrifice and proof that the police are thugs. That doesn't mean that police never brutalize protesters, of course, but the protesters aren't always the victims they claim to be. Yesterday at U.C. Davis trespassing protesters dug themselves in so police couldn't pull them apart and were told they would be pepper sprayed if they didn't disperse. You can guess what happened next. Now left is are up in arms about police brutality, excessive force and freedom of speech - concepts they clearly don't understand. If you break the law and dare the police to enforce it, they will enforce it. It is an automated response, like pressing a button. The fact is: the administration of UC campuses systematically uses police brutality to terrorize students and faculty, to crush political dissent on our campuses, and to suppress free speech and peaceful assembly. Sir, you do not understand freedom of speech. With some narrow exceptions, the content of speech can not be censored. There are, however, limitations on time and place speech can be expressed as long as they are content-neutral. One can not hold a protest that blocks the lanes of an interstate highway, for example. 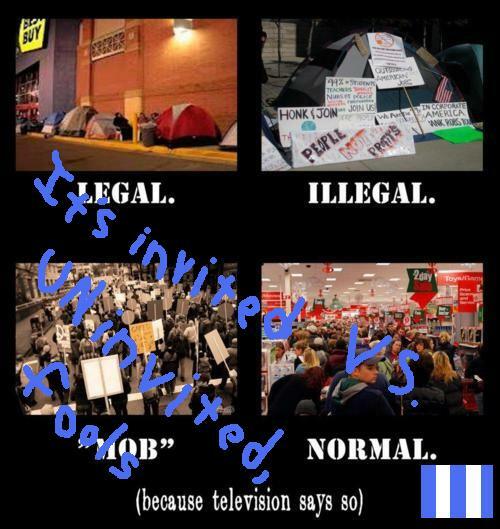 It doesn't matter if the protesters were non-violent, they were illegally "occupying" space they were not allowed to be. They linked their bodies in a way that made it impossible for the police to pull them apart without using something like pepper spray. If the police catch me robbing a bank while singing "Born to Run," the police are not suppressing Bruce Springsteen music. Likewise, when people - students, kids, veterans or whatever kind of people they are - illegally trespass, it doesn't matter to the police why they are doing it. The police will use force before they'll tolerate law breaking. And you knew this. Next time you feel like organizing a protest where participants break the law and dare the police to pepper spray them, I expect to see you on the front line. This is a bait-and-switch routine. The protesters break a law and act as if the police are after them for their beliefs. Anyone who believes this narrative is a sucker. Can we find a definition of rich and stick with it? This morning on NPR, Fresh Air host Terry Gross brought on guest Tim Dickinson who recently wrote an opinion piece in Rolling Stone masquerading as a news article on how American tax policy drives inequality. Terry Gross: "Have taxes become less progressive in the past few decades? And by progressive, I mean the idea that the more money you make the higher level you're taxed?" Tim Dickinson: "The most important place where that's true is with investment income. In the tax reform of 1986, Ronald Reagan brought the top marginal tax rate down to 28 percent, which is far below where it is today, but he also brought the capital gains tax up to match it." You see what he did? She asked him if taxes are less progressive, and his answer was to say they are in one narrow aspect. This misleads the listener into believing that taxes are less progressive in all aspects. Dickinson's answers use a common trick people make when they barrage you with economic data to prove a point: they keep changing the parameters of the concept they are talking about. In this case, it's what group is counted as rich. In my last post, I showed how even when you include capital gains and dividends as income and factor in loopholes, the top 1 percent pays the highest tax rate in the nation, projected at 33.8 percent this year. The Occupy Wall Street crowd set the line at the top 1 percent, and the interview starts with that parameter, but then Dickinson moves the goalpost to the top 10 percent. Then when he wants to make the point that rich people pay a lower tax rate, he moves it again to the top 400 earners with their tax average rate of about 17 percent. He's not alone. Sometimes the line is moved to the top 0.1 percent. Irregardless, while there are a few anecdotal examples of rich people that have found a way to pay a lower tax rate, you have to leave out a lot of multi-millionaires to concoct a definition of "rich" that pays a lower tax rate on average. It's no different than holding up a handful of welfare cheats as proof that all people on government assistance are scammers. The rich have received tax reductions in recent years, but so has everyone else. Some lefties like to point out that the top federal marginal tax rate in 1963 was 91 percent, but what they don't realize is that the lowest tax bracket at that point - the poorest of the poor - had to pay 20 percent. Please don't take my word for it, scroll through the numbers for yourself. You can go back to 1954 and see those same extremes were the same for everyone. For comparison, In 2001 the lowest tax bracket was 15 percent and the villainous Bush Tax Cuts brought it down to 10 percent. In the interest of fairness, if you want a further historical perspective, 1913 had 1 percent tax for the lowest and a 7 percent tax for the highest and by 1918 the poor had a 6 percent tax while the highest marginal bracket was 77 percent. Taxes have been all over the place and while one can argue they're not as progressive as they were in 1918, they're certainly more progressive than they were in the last 60 years the spotlight is focused on. Dickinson must have done a lot of digging through the data, so he knew how much more progressive taxes are today than in the last 60 years. The way he worded his answer shows that he deliberately altered his definition of rich to focus on the top 400 to a prove his point - a point that is completely reversed when the data set is expanded. There is a lie being repeated that America has a regressive tax system, that the rich pay a lower percentage of their wealth than the middle class. Instead, we have a progressive tax system that has done a great job of keeping inequality in check. As I've said before, there's nothing wrong with inequality. What we should focus on is the well-being of the poor, and the poor in America enjoy a high standard of living. The recent Bruce Meyer episode of Econtalk made a compelling point that inequality is much lower than the pundits claim because they are merely looking at pre-tax income. Once you factor in taxes, consumer spending and government assistance programs like the earned income tax credit you see a much different picture observe. Both the left and the right make the mistake of focusing on the top tax bracket in the past, which was higher than it is today, but affected few people. A much larger percentage of our federal taxes paid by the wealthy, and it's not just because they have more of the wealth. We are seeing lower taxes for the poor and middle class. Enter Warren Buffet and the claim that he pays a lower tax rate than his secretary, whose income was never identified. He claimed he paid 17.4 percent while everyone else in his office pays 31 to 44 percent. Greg Mankiw said that isn't even true, but let's play along and say it is. Is it fair for members of the left to use him as an example to "prove" that the rich pay a lower tax rate, like "Bob" did in an exchange we had in a comment section at For The Sake of Science last month? People rightly claim that taxpayers are able to use loopholes and write-offs to reduce their tax bill, and the rich have access to smart accountants who can exploit them, so could this stymie the progressiveness of the official tax rates? It's plain to see that in reality, the five different quintiles fall neatly in line, with the top 1 percent that gets so much focus today paying the highest at 33.8 percent. It is a lie to say the rich pay less of a percentage of taxes than anyone else. All is not lost for the left. They could simply abandon this bogus claim of a regressive tax system and instead focus on the gains that have come through lowering taxes for the poor and middle class and various "redistribution" programs like the earned income tax credit. That would allow them to sleep better at night instead of, in the words of Michael Munger, elevating the sin of envy to a virtue. Imagine a caveman wakes up in the modern world, sees a television for the first time and smashes it with the first object he can lay hands on. He doesn't know anything about it, but assumes it's a threat and feels compelled to destroy it. That sums up the young lefts view of corporate personhood. People with no understanding of business law have taken it upon themselves to edit the constitution to strike at firms they see as their enemies, but don't realize how savage their actions really are. The point of a corporation is to create a legal entity that can own property, has its own debts and can spend its resources. It is, in essence, a stand-in for a group of people. It is not, as critics like to remind us, an actual person, but that doesn't mean corporations don't deserve rights. ...If corporations had no Fourth Amendment rights, the police could storm corporate offices and cart off computers and files for any or no reason. If corporations had no Fifth Amendment rights, the mayor of New York could exercise eminent domain over Rockefeller Center by fiat and without compensation if he decides he’d like to move his office there. ...When rights-bearing individuals associate to better engage in a whole host of constitutionally protected activity, their constitutional rights remain fully intact. These individuals do not lose their right to speak or act simply because they chose to exercise those rights by pooling their resources in a corporate form. The targeted constitutional right that activists want to take away from corporations is freedom of speech, following last year's Supreme Court decision in Citizens United vs. Federal Election Commission. As retired ACLU executive director Ira Glasser carefully explained, the case did not allow corporations to make unlimited campaign contributions like the left claims. Instead, it ended a stupid censorship ban that protected politicians from being criticized by corporations or unions around elections. This was a victory over censorship. The inequities of speech that flow from the inequities of wealth are certainly a big and distorting problem for a democracy, and have always been so, and not just during elections. No one knows how to remedy that, short of fundamental re-distributions of wealth. But I'll tell you what isn't a remedy: granting the government the power to decide who should speak, and how much speech is enough. Nothing but disaster flows from that approach, and that was what was at stake in this case. This idea of leveling the playing field for speech belongs in Harrison Bergeron's dystopia. If an entity's speech is too persuasive because of its reach, scope or volume, why not censor speakers who are skilled at attracting large audiences or making compelling arguments? Free speech does not need government oversight, and the ACLU has consistently supported corporate speech rights, despite left-wing campaigns that try to pressure them into switching sides. Without free speech, corporations would be handicapped in trying to defend themselves in the public arena. Suppose a large group of naturalists starts a campaign that Acme widgets cause cancer, and have no scientific basis for this claim. What happens now? The activists get in the press, they talk to other people and they may be allowed to pass out their literature in classrooms. But the corporation isn't a real person, so it needs to spend money in its own defense to speak. Perhaps science-based speakers will call the activists on their nonsense, but should Acme have to wait around hoping for good Samaritans? Why prevent it from launching a similar campaign to correct the lie using its own resources? As my fellow defenders have been quick to point out, many groups the left loves are corporations who enjoy free speech. There's the ACLU, Media Matters, the Daily KOS, MSNBC, NORML MoveOn.org and the transparently-named Corporation for Public Broadcasting. Once again, members of the American left are on the wrong side of a freedom of speech issue. Censorship harms the potential listener, not just the thwarted speaker, and adults don't need a moderator to decide who they can listen to. The squirmy nature of Occupy Wall Street makes fair criticism a difficult task. Because there's no official list of demands, critics can pick the views expressed by the stupidest supporters and go to town on them, as if that disproves the entire movement. I don't want to break my own rule on idiot hunting and prop up the ignorant as living straw men to dismantle. That's too easy. For example, early on everyone was looking for a list of official demands and a list from the official website got passed around. Now it has a snarky introduction saying it's a forum post, not an official list. The intro criticizes people who interpreted the list as official, but the web design was so poor that it was impossible tell it was a forum post. It said it was a real list. The list featured some silly ideas like declaring a minimum wage of $20 an hour, making huge government programs, canceling all student debt and outlawing credit reporting agencies. I could snap these ideas apart in my sleep, but that doesn't actually prove anything. The real ideas to target are the calls to end corporate personhood, increase regulations and lower the income gap. That is real engagement and the only way to seriously combat this movement is to strike its strongest points. Kicking infants doesn't prove anything. I've been more than fair in making the distinction between the violent bomb-throwing anarchists who started the protests from the liberal supporters who tolerate them. I personally wouldn't want to support a movement that overlooks calls for violence and illegal behavior, but that's their mistake to make. It's also hard to make criticisms of the idiots stick, as the movement is so fragmented most supporters will just say they don't believe in that idea or move the goalpost to another issue if they do. 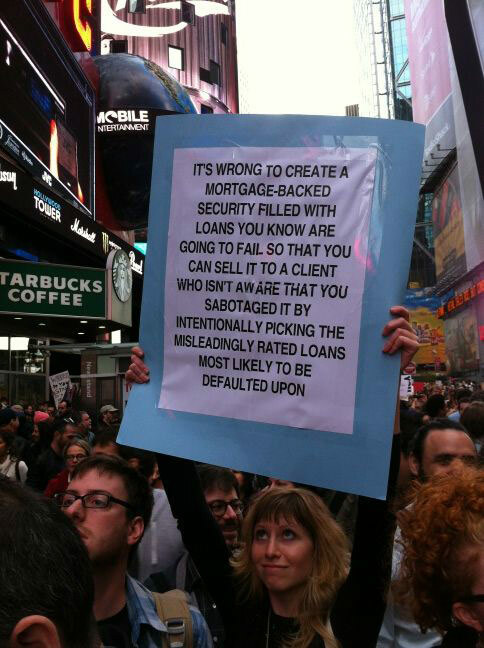 Idiot hunting won't defeat OWS. I will, however, mock stupid ideas when they make their way to the front of the pack. Take the idiot who left a cushy tenured position in the NYC school department to get a masters degree in puppets. He wanted to get an extra $10,000 annually by exploiting the salary guidelines, but the job was gone when he finished playing with puppets. This person is clearly a fool, not a victim, and it would be pure idiot hunting to single him out as a typical Occupy Wall street protester. That is, it would be if The Nation hadn't done just that in a sympathetic piece written by their executive web editor. It's not idiot hunting when the claim makers are the ones propping them up as a fair example. The Nation is about as disinterested and seperate from this movement as Nintendo Power is from Nintendo. This is completely fair game. If you decide to "pursue your passion" in an un-economic area, don't be surprised when the economic system doesn't value you highly, and don't think that the problem is the system; the problem is you. Christ. Puppets? What an idiot. I thought the theme of Occupy Someplace protesters was to stand around somewhere you're not supposed to be and dare the police to remove you, then complain about the police department's use of force. Today Occupy Boston tried to do the opposite and get Greg Mankiw's entire Ec 10 class to walk out on him at 12:15 p.m. In an open letter, an organizer claimed the introductory course doesn't teach the type of economics they like. What a ridiculous thing to say. Adam Smith is indeed the foundation of modern economics, and I imagine a low-level biology class treats Charles Darwin the same way and a creationist would try to cite a lack of academic journals in an argument for teaching rib-based origins. Someone else has written a more in-depth take down of this silly accusation, so I will outsource that aspect of my post. I imagine this protest has little to do with the declared motivation and is really about his role as an economic advisor in the Bush administration and some of his mocking posts about the movement and challenges to their assumptions. Regardless, the protest was a flop, as only five to 10 percent of the class participated, and that was offset by former students who occupied the class in support of Mankiw. 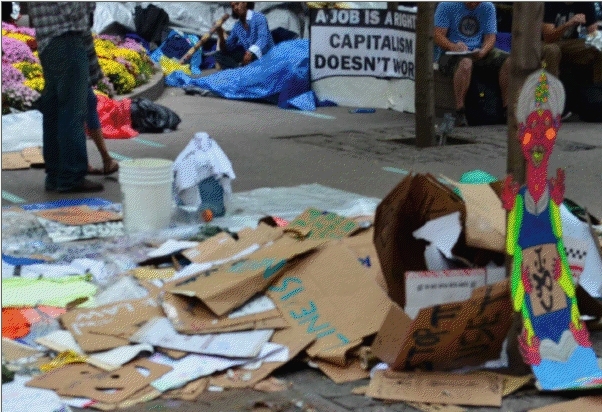 As Tyler Cowen wrote today, "OWS supporters should be embarrassed by this garbage behavior." They won't. Add this to the long list of shameful actions protesters have committed and moderate supporters have overlooked. These moderate supporters, who I have gone to great lengths to distinguish from the bomb throwers, do not have clean hands. They are holding hands with violent thugs and have been cheering protesters on to resist when police try to remove them for trespassing. This is essentially taunting the police to enforce the law. The moderates celebrated when New York police decided against enforcing the evacuation of the park, but when Oakland police used force they carried on the liar's cry of victimhood. Now that has spiraled into shutting down the Oakland port, and they still haven't lost the support of the herbivores. Greg Mankiw has said he considers himself a diplomat of the economic literature to his students, and his goal is to share what major economists have discovered even if he doesn't agree with it. It's a shame that with the ignorance of these protesters, the one place they aren't willing to occupy is an economics class. Last week my friend Dylan wrote, "We're about to reach 7 billion beautiful human beings on this planet." This week the estimates finally added up to 7 billion. Humanity has reached an amazing milestone, but all I can hear on the subject is the familiar cry of the doomsayer. Harold Camping is a nut for making his Biblical prediction that the world would end earlier this month, but the people claiming 7 billion is too many get a pass in polite society. It's been 200 years since Malthus predicted the world would be crushed under the weight of human beings, and the cranks just keep delaying the date every generation. People like Paul Ehrlich and John Holdren should be court jesters or lead around on a leash, not placed in academia or made presidential science advisers. There's no way to know who this 7 billionth person really is, so I will refer to him as "Julian" after economist Julian Simon . The doomsayers believe that people will keep eating resources at a constant rate until the supplies run out, then starve. They have not considered that as a resource runs low, the price will rise and people will be forced to reduce consumption and look for alternatives. We will not stop at 7 billion. The United Nations predicts the human population will peak at 11 billion in 2050 and then fall. I wish to challenge that view. As long as we have science and reason, as long as we have innovation and discovery, we will continue along our path of finding new ways to make life better for the many people of this glorious world. We can all live longer, fuller lives, and what's more, I think we will. I welcome Julian to our world with open arms and I hope to live to see another 7 billion standing next to him. One minute the police are hardworking union members. They are public servants who hold society together, and it's a scandal that Republicans and Tea Party members want to reduce or restrain taxes and risk putting them out of work. The next minute the police are evil thugs who make unprovoked attacks on innocent protesters. These police officers can't stand the anti-rich and pro-union statements the peaceful Occupy Wall Street and anti-globalization protesters make and assault them. For some reason, those same police officers don't get in fights with the low-tax anti-union right wing protesters. These same protesters who want to reduce the benefits of public employees, such as for the police department, are never brutalized. I understand that there's a diversity of opinion on the left, and individual progressives should not be expected to hold views consistent with every other leftist. But the logic still doesn't make sense if you believe the fable that modern American police are fascist thugs who make a habit of attacking left wing protesters. The simple answer is the protesters are lying. We already know Occupy Wall Street is filled with people who want to smash things and fight the police. A third in a recent poll said they believe in violence to advance their goals. There's no great mystery here, the protesters are causing violence and then pretending to be the victims. Dorian Electra, the same singer-songwriter who brought us I'm in Love with Friedrich Hayek last year has brought us a song about Keynes, and it's not a love letter. This second song is a departure from the rap genre for Keynes vs. Hayek music and it may open the door for others. I'm waiting for Merle Hazzard to record a Marty Robbins-style gunfighter ballad between the two gentlemen from Europe. There's a lot of fun things going on with the Transportation Security Authority - "fun" being a synonym for a farcical horrors - from yet another case of TSA agents going mad with their moderate amount of power to a satirical Playmobil Security Check Point playset posted on Amazon.com All of this has caused me dig up a post I wrote almost a year ago. 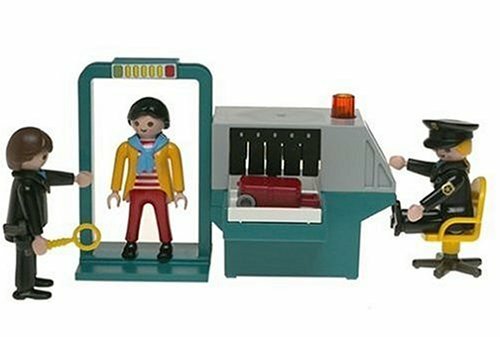 I predicted that the public outcry would continue to rise on the Sophie's Choice scenario the TSA was giving passengers of being felt up or photographed with an 80's teen movie clothing-penetrating nudie camera. Public opinion would cascade into people finally evaluating the trade-off between security and freedom, and the public would finally stand up and say the terrible cost does not justify the limited benefit and self-interested politicians would cave and interfere. What happened instead was, nothing. Nothing has changed, we're just where we were a year ago. Members of the general public have now absorbed the phrase "security theater" into their vocabularies and understand that a lot of these civil right violations give us no actual increases to security in return. I still have a month to go from a full year when I made the prediction, but I'm calling it here. We're going to be stuck with this, and it'll get worse before it gets better. I'm finally getting around to expanding on my "Knee-deep in subculture" tag where I record my observations from interactions with various groups, which so far includes yoga hippies and the Occupy Boston protest. In January 2008, I attended a free weekend anarchism convention in downtown Portland Maine that was promoted on an acquaintance's MySpace page. I wanted to hear what they were all about, as I was still somewhat new to calling myself a libertarian and expected to find a lot of common ground. I was completely wrong about that. I was also completely wrong in my jokes that an anarchist convention would be fatally disorganized. There was about 40 of us sitting close together on the carpet while the organizers spent more than an hour explaining the rules for us. The weirdest one was how we were to use "caususes" in case we belong to minority groups that are offended and wanted to pause the meeting. For example, if someone said something about gays that a gay person didn't like, they could pause everything like a Zack Morris "Time Out." All the gays would discuss the issue outside while everyone else waited in silence until the gay caucus came back in and presented their findings. Fortunately, that never actually happened. We were told to introduce ourselves by our names, why we were there and what gender of pronoun we preferred. Seriously. I made no attempt to infiltrate the group as a rebel. I wore a tie while everyone else was in gutterpunk garb. Most of the attendees were in their teens or early twenties and there was one bearded elder who attended Woodstock and never hatched from his tie-dye cocoon. The discussions were like a pageant for who could display the most economic ignorance. I quickly learned the difference between individual anarchism, the kind I was hoping to hear about, and collective anarchism, which is just ho-hum anti-capitalism, anti-corporation, anti-globalization Marxist opium dreams. There was applause when someone talked about their "vote for no one" campaign, which included putting signs around town that said "Don't vote, they're all Nazis". Everyone spoke starry-eyed about the concept of "rising up," where the general public would become swayed to their side and overthrow the system from the inside. No one offered example of this actually happening. I repeatedly heard people say that graffiti messages would help the public learn and appreciate their political messages. 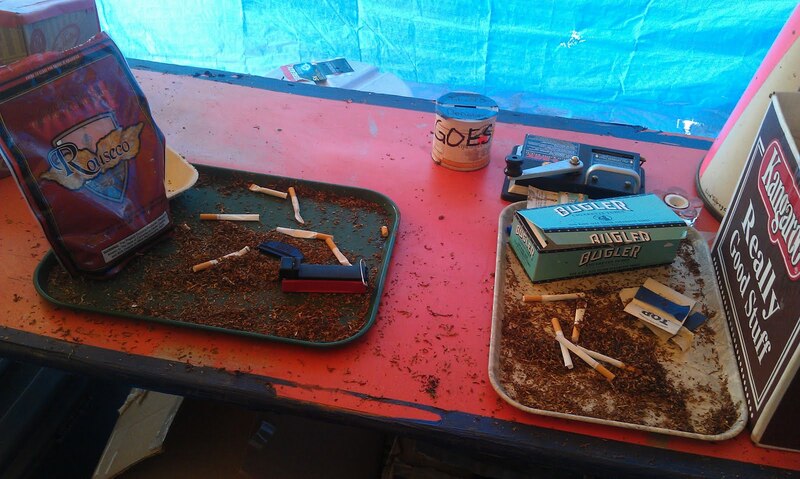 During a workshop on how to get Bank of America to stop loaning money to companies that perform mountaintop removal mining, one girl suggested that they go into a Bank of America branch and smoke a bunch of cigarettes to mimic air pollution, and this would cause the employees to rise up and change the company from the inside. This suggestion received a ton of applause, and no one questioned that giving low-level bank clerks a tough time is going to sway them to your side, and even if it did, how that would translate to changes in corporate policy. To their credit, activists from Earth First! had a good understanding of focusing on cause and effect to achieve their goals, instead of just feel-good public spectacles. They lead a discussion on spiking trees to stop logging companies. Someone in the audience spoke up about how tree spiking poses bodily risk to the laborers and they were immediately shushed by everyone else. An Earth Firster said they were just talking about effectiveness of the tactic now, and would discuss the ethics of it later. That discussion never happened, as should be expected. After a free lunch of vegan-friendly food swiped from dumpsters, everyone started talking about how they were going to stop the "Iron Sea." This sounded menacing, and I finally asked what it was. It turned out to be the upcoming 2008 Republican National Convention, or RNC. We broke into groups to brainstorm ways to disrupt the RNC, and everyone submitted illegal ideas like sabotaging the bus system and blocking the streets to keep people from attending the convention. It was clear the spirit of democracy was absent. 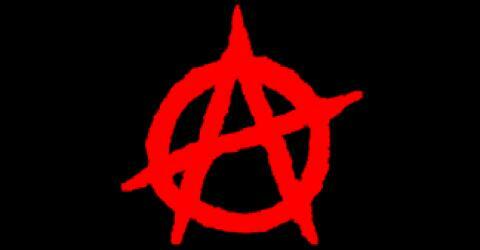 I learned that anarchist protesters divide themselves into different sections depending on their rioting preferences. Non-violent people will be in one place and those who want to assault the police and burn cars go elsewhere. They have "medics" with red cross decorations to help get pepper spray out of rioters eyes and they get free legal help from the National Lawyer's Guild activist group. This should sound familiar with anyone who read the Occupy Boston post I made last week when I interviewed Mark. The same breed of violent protesters are intertwined with the gentle reformers of Occupy Wall Street, and I don't think enough supporters realize who they're marching with. The anarchists were not the least bit shy about talking about these intentions to commit violent crimes. I was a clean-cut guy in a tie and vest who was taking notes and they still spoke about openly about terrorizing political rivals. These groups start riots and when they get arrested they lie to the public and say they were peaceful protesters who were attacked by evil police. There are anarchists who don't participate in violence, but they are still willing to work with the bomb-throwers. Tolerance of evil is corrupting. I think it's telling that they claim the police are Nazi-like thugs, but a lot of their tactics depend on the police respecting their civil liberties, like chaining their hands together in tubes or tying themselves to buildings. How would it have gone if a group had chained itself to the gates of Auschwitz? I'm not sure if anyone from the convention was part of a group of masked rioters arrested at the Republican National Convention for the usual stuff: fighting police, burning cars and macing old women. The local alternative weekly repeated all the usual lies in support of the rioters, and then praised them when a judge threw out the case because their masks spoiled photographic evidence. This is what I've been trying to warn my liberal friends about when they say they support the Occupy Wall Street movement and tolerate the extremists inside. Anarchists are brutes who want to violently overthrow the country, and they have murdered people on Wall Street before. I've seen masked men in Boston with my own eyes and I can't overlook the threat they represent. These people want blood, not reform, and I have trouble seeing how anyone could justify having them as allies. I've been reading about "procedural liberalism" and the idea that all members of a just society must play by the rules, and I'm having trouble reconciling this with the actions and philosophy of the American left. As I wrote last time, some members of the left purposely break the law to get arrested, then present themselves as martyrs. If you trespass while shouting to legalize human-onion marriage, you are not a victim of interkingdom romance puritanism. Your freedom of speech has not been trampled. You are simply someone who tried to hang out where they're not allowed to hang out. "I Am Not Moving" is the title of the obnoxious video comparing Occupy Wall Street protesters to Arab Spring protesters, which is like comparing George of the Jungle to Tarzan. Despite this stern title, when you violate a no-trespass order and the blue-shirted union workers with black boots and billy clubs come for you, you are in fact moving. If you supporting breaking the law as part of a protest, from mild civil disobedience to property destruction and rioting, then you can no longer claim to be a procedural liberal. My point is not that something is immoral or bad because the legislature had declared it illegal - Bryan Caplan has already destroyed that view - but that once you've thrown that out the window, you have lost all claim to the philosophy of respecting fair procedures. Not that the left has any claim to greater respect for the rule of law or fair procedures. Former President George W. Bush certainly broke his share of laws, but President Barack Obama instructed the Justice Department not to defend a law he doesn't like. Sure, that law was a federal ban on gay marriage, but that's not the way we do things here. The correct answer to bad legislature is to change it, not break it or ignore it. The reason we should follow written legislation is that it is a contract of rules to follow. I don't like our strict immigration laws and I want to see them relaxed, but I can't find myself getting worked up because a public school wants to only accept pupils that are legal residents, or a police agency wants to check if a suspect was violating immigration laws. The government should be bound to follow the law. Procedural liberalism is lumped in with concepts the left claims to hold a monopoly on, like fairness and justice. They want no such things. To the left, fairness means handicapping someone who plays by the rules. If a white male student works and studies hard, affirmative action proponents say he should have a tougher time getting into a particular college than a black student. This is being purposely unfair to individuals to attempt to create fairness in totality. They assume they have overcome the Hayekian knowledge problem and have perfect information so they can balance the scales flawlessly. In fact, they throw out the natural fairness of the world and impose a flawed attempt at artificial fairness. Neither approach is actually fair, but one incorrectly claims to be. The same thing carries over to wealth "redistribution," limiting corporate speech, eminent domain and retroactively banning Wall Street bonuses from bailout money. People have a nasty habit of supporting the rules when it suits them, and abandoning them when they don't. The right is just as guilty of this, but it never branded itself the defender of fairness. You can't claim to be a defender of consistent procedures and equal observation of the rules and still break the law when it helps your political goals. That is the mark of barbarism, not liberty. It's entirely possible that there are members of the left who reject law-breaking protests, inconsistent judicial actions and the handicapping of the innocent, but they have been drowned out by the rest.